The intimate Hotel Encanto Palacio Azul (painted powder blue) was originally built in 1921 by an architect Alfredo Fontana and used to be a private residence of a wealthy tobacco baron. Only in 2004 was the neo-classical water-front mansion, capped by a Mughal-style domed turret, renovated into a lovely, colonial style hotel. The ambiance throughout clings to the hotel's 1920s roots. A restoration has left the structure and its highlights, such as the colonial style tile floors, intact. And the lofty ceilings lend a sense of airy spaciousness. The bedrooms are named after flowers; on the ground floor there is Marilope, Azucena and Mariposa' while Orquidea, Dalia, Verbena and Margarita are on the second floor. The modest furnishings in subdued pastels are a tad bland, but the rooms are comfy enough and have both air-conditioning and en-suite bathrooms with shower-tubs. Satellite TV, refrigerators, and in-room safes are standard. 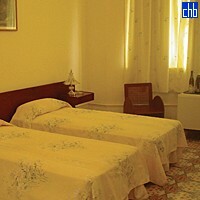 Rooms on the second floor are the best bargain, especially Dahlia, which has fine view over the bay. Six of the rooms have balconies (Mariposa does not). 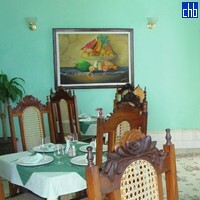 Facilities are limited to a a lobby bar and small restaurant serving from a limited criolla and continental menu. But Palacio Azul is located on the Malecón boulevard next door to the Cienfuegos Yacht Club with billiards bar, restaurant, and nightclub. 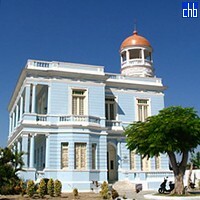 It is just a short walk from Cienfuegos’ main square, which makes it ideal place for tourists who wish to explore the famous city, its culture, architecture, traditions and customs. The rooms are simple, clean, high-ceilinged and with original floor-tiles and cornicing; with comfortable beds and feather pillows. Although the hotel has a wonderful position right on the sea, none of the rooms have a direct sea-view.